Taylor GS Mini Mahogany Acoustic guitar. The award-winning GS Mini was designed to be the ultimate musical companion, wherever you go — or stay. Inspired by the big, bold sound of Taylor’s GS body shape, the Mini scales things down without skimping on sound, packing a ton of tone into a comfortable travel size and giving you a guitar that’s full-voiced and incredibly fun to play. 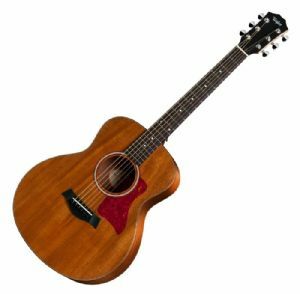 Think of the Mini as a modern-day parlor guitar, perfect for playing around the house but also built to fit an active lifestyle. With Taylor’s patented NT® neck, you’ll always enjoy signature Taylor intonation and playability. So, wherever you end up, the GS Mini will be ready to play.